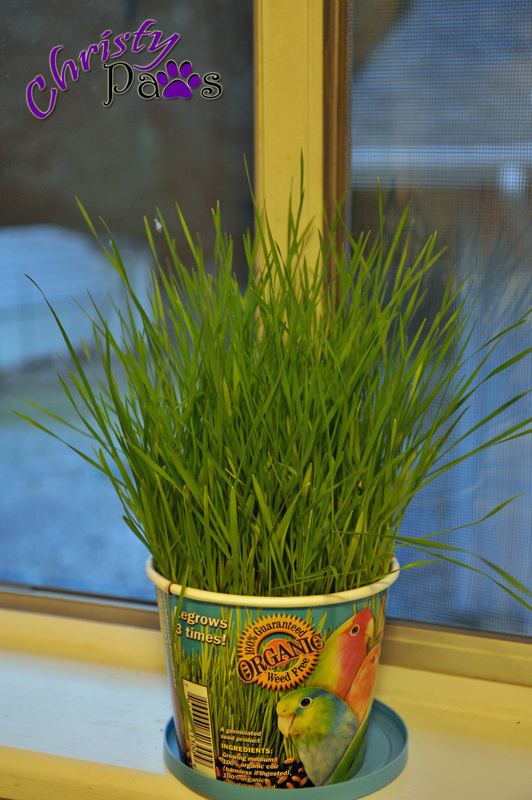 Before mom headed back down to southern California to pack up the rest of our belongings, she started some kitty grass (yes, I know the container says birdie grass) for us on the windowsill. Mom hasn’t grown us grass in a very long time and, as an indoor cat, that’s the only time I get it. It grew quite nicely while she was gone and is now ready for us. Since it is in a cardboard container, it is not very heavy. Mom didn’t want to just give it to us to munch on because she knew the boys would just turn it over or pull it out and make a mess with it. 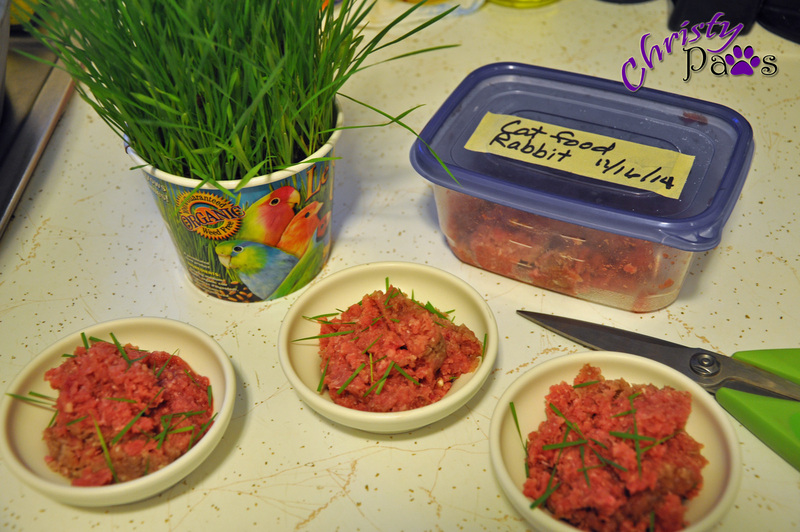 So, instead, she snips it over our raw food just like chives on human food! What a yummy little treat. I know why I eat grass — I like it, but mom wanted to know what the experts say about it so we did some research on the internet. Here are some of the theories about why we eat grass. Cats regurgitate when they eat grass because they lack the necessary enzymes to break down vegetable matter, so this may eliminate all indigestible material from the digestive tract. Perhaps they like the taste of the sweet juices in grass. It helps a cat to cough up hairballs. It may act as a natural laxative, moving hair that wasn’t hocked up in hairballs and moved farther into the digestive tract, out the other end. OK, so who really cares why we eat it!?! I say, let ’em eat grass! Tagged cat, cat grass, cat treats. Bookmark the permalink. Our cat is an indoor cat.. but I noticed that every time we open the door lately she darts out to go get some grass, I think she loves it!! Whenever one of my kitties eats a piece of grass, they always puke it up. Kitty grass is a big favorite here too. Mmmm….grass! Jewel loved to eat grass. I’ve been wanting to grow some for Carmine and Lita, but we really don’t get much sun on my side of the building. I wonder if I should try and grow it for them anyway? We don’t have a lot of sun here right now and it was pretty cool in the kitchen window while mom was gone but you can see how well it did. I’d say give it a try. Yep, We like to eat gwass too. Mommy grows it fur us a lot, and it always helps us hurl. MOL Yous got sum purretty pawsum lookin’ cat gwass there and OMC mouff waterin’ good lookin’ food. Enjoy.